Shuttle Endeavour Blasts Off On Final Mission Endeavour, the baby of NASA's fleet, roared off the launchpad at Florida's Kennedy Space Center for its final mission in 19 years of service. Arizona Rep. Gabrielle Giffords, the wife of mission commander Mark Kelly, was among the tens of thousands who gathered to watch. The space shuttle Endeavour made a picture-perfect liftoff Monday morning as it headed for the International Space Station in the penultimate flight of the shuttle era. Endeavour roared off the launchpad at 8:56 a.m. ET carrying a six-member crew and a multibillion-dollar particle physics experiment. One final shuttle mission remains, by Atlantis in July. The crew of space shuttle Endeavour made their way to the launchpad at the Kennedy Space Center in Cape Canaveral, Fla.
As many as a half-million people were expected to gather in the area around the Kennedy Space Center in Florida to watch as Endeavour streaked into space one last time before heading to retirement at a Los Angeles museum. Among them was mission commander Mark Kelly's wife, Arizona Rep. Gabrielle Giffords, who is recovering after being gravely wounded in a shooting rampage in Tucson earlier this year. "Who's ready for the best show on Earth?" Giffords' staff said in a Twitter update hours before liftoff. Kelly and his five crewmates had waved, gave a thumbs-up and shook their fists in the air as they headed to the launchpad in the predawn hours before their 16-day mission. 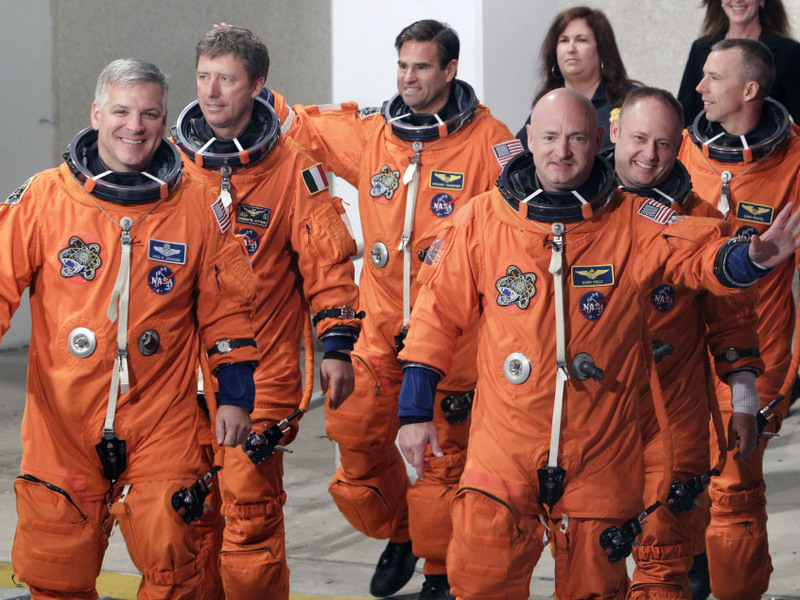 "It's in the DNA of our great country to reach for the stars and explore. We must not stop," Kelly said just before launch. "To all the millions watching today, including our spouses, children, family and friends, we thank you for your support." It's in the DNA of our great country to reach for the stars and explore. We must not stop. The astronauts — five Americans and an Italian — posed at the base for a group picture Monday, before taking the elevator up and climbing into Endeavour. "Took my last shower for a few weeks," astronaut Mike Fincke reported in a pre-launch tweet. "The flight docs gave a good look-over. My only issue: too much boyish enthusiasm. (no known cure)." Pilot Gregory Johnson said in his own Twitter update: "I am really excited and charged up for this mission! Slept great." The event generated the kind of excitement seldom seen on Florida's Space Coast on such a grand scale — despite a delay of more than two weeks from the original April 29 launch. Since then, NASA replaced a switch box with a blown fuse as well as a suspect thermostat, and installed new wiring. Giffords, who flew in Sunday from Houston, where she's undergoing rehabilitation for a gunshot wound to the head, was among 45,000 guests expected to watch the liftoff at the launch site. An additional 500,000 spectators were likely to jam area roads and towns to send off Endeavour and her crew. 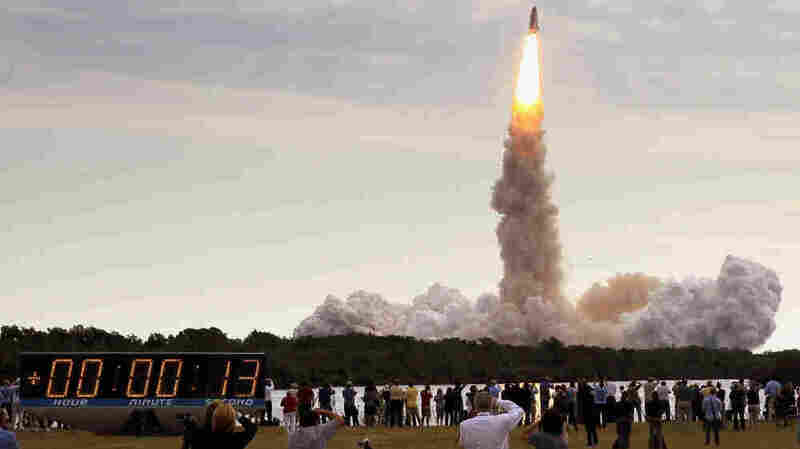 The shuttle's liftoff was also likely to be watched by more than the usual number of physicists. That's because Endeavour is carrying up a $2 billion particle physics detector known as the Alpha Magnetic Spectrometer. The AMS will be mounted onto the International Space Station, where it will collect cosmic rays — charged particles that zoom through space — for a decade. The equipment was designed to search for primordial antimatter created during the Big Bang, and the mysterious dark matter that makes up much of our universe. Nobel Prize-winning physicist Samuel Ting of the Massachusetts Institute of Technology pushed for more than 16 years to make the project happen, raising money to build it with the help of hundreds of researchers in more than a dozen countries. Ting said no one knows what the AMS might discover. "I mean, if you find what you predicted, it's not interesting," he said in an April interview. "The interesting thing is to destroy the current idea, to find something new." Endeavour first flew in 1992 and ended its first mission 19 years ago Monday. The shuttle has flown 116.4 million miles in 24 previous flights. It is the baby of NASA's shuttle fleet and was built to replace the Challenger, lost in a 1986 launch accident. Sisters Anita and Andrea Johnson drove across Florida from Tampa for a front-row view. "We usually stand in our backyard to watch the launches, but this time we wanted to see it up close and personal," Anita Johnson said as she pulled lawn chairs out of her car parked across the Indian River in Titusville, Fla.
To the south toward Cape Canaveral and Cocoa Beach, recreational vehicles and cars already were lined up along the Banana and Indian rivers late Sunday. And signs outside area businesses cheered Endeavour on with messages of "godspeed" and "go." NASA is retiring its three remaining space shuttles to concentrate on interplanetary travel. The space agency wants to hand over the business of getting crews and cargo to the space station to private companies. At least one company, Space Exploration Technologies Corp., said it can get astronauts to the space station within three years of getting NASA approval. NPR's Nell Greenfieldboyce and Judith Smelser of member station WMFE contributed to this report, which contains material from The Associated Press.